When is time to stop fighting? Party mates are gradually abandoning Lopez Obrador in his fight against Mexico’s election results. An editorial in the Spanish newspaper El Pais on 15 July called the second-place finisher in Mexico’s presidential election a ”burden” and advised the country’s left to rethink his leadership. Andres Manuel Lopez Obrador hit back, accusing Spain of “colonial journalism”. However, a number of the prominent members of his party seem to agree with the Spanish commentator. AMLO, as Mr Lopez Orador is known in Mexico, filed a legal challenge to the results of the 1 July presidential election. It is now up to the three judges who sit on the Federal Electoral Court (Trife), the maximum authority, to address the complaints regarding the election. The court has until early September to rule on the validity of the vote. Many senior officials from Amlo’s Democratic Revolution Party (PRD) believe their results were good. There were also elections for Congress, several state governors and local governments alongside the presidential poll. The PRD has won 101 out of 500 seats in the lower house of the Parliament, and 22 seats in the 128-member upper house. The party has also won two out of six contested governor posts and the one of the mayor of Mexico City. If the successful candidates challenged the legality of the presidential vote, they would also be hanging question marks over their victory. Not suprisingly therefore, they are very careful when positioning themselves on the issue. The newly elected governor of Morales, Graco Ramirez, has quickly distanced himself from AMLO, saying he prefers to govern his state. The current mayor of Mexico City, Marcelo Ebrard, has ruled out vote-buying in the capital . His successor, Miguel Angel Mancera, tweeted on 2 July: “Every candidate has the right to contest the election. Exceeding campaign expenses, as @EPN (Enrique Pena Nieto) did, is an electoral offence.” However, he recognized Mr Pena Nieto’s victory. 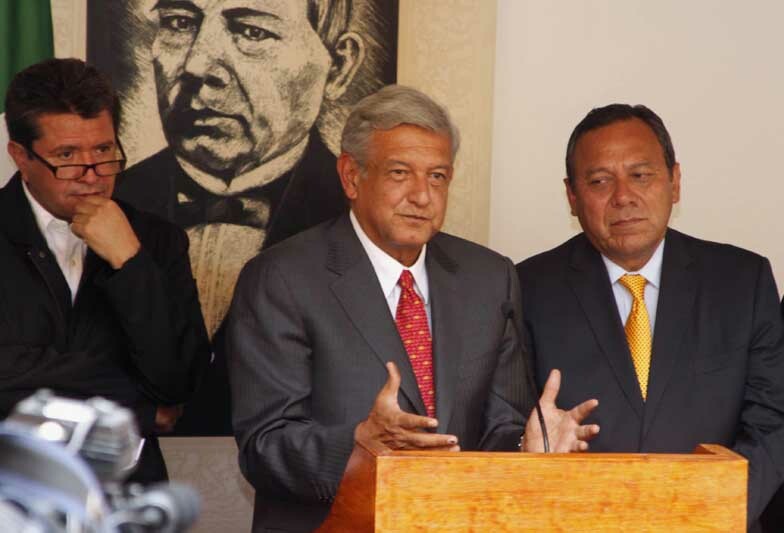 The PRD’s bigwigs urge Mr Lopez Obrador to avoid repeating 2006 and instead to take advantage of the influence the party has won in the Parliament and state governments to bring about the changes they propose. There is something in it. But so there is in Mr Lopez Obrador’s claim that he cannot accept fraudulent results. AMLO alleges that Mr Pena Nieto bought as many as 5 million votes – over 6% of Mexico’s 79 million voters. If this was true, the results of the election, which now say AMLO lost by some 7% of the vote, could have been very different. Although the support for AMLO is waning among his party colleagues and some commentators say he has alienated many of his middle class followers by the havoc of 2006, there are still many willing to fight battles for him on the streets as well as online. Thousands took part in the second “mega march” in Mexico on 14 July. Videos of protests staged in other countries have been posted on Youtube. Social media demonstrate well the support Mr Lopez Obrador is drawing, but also what a divisive personality he is. 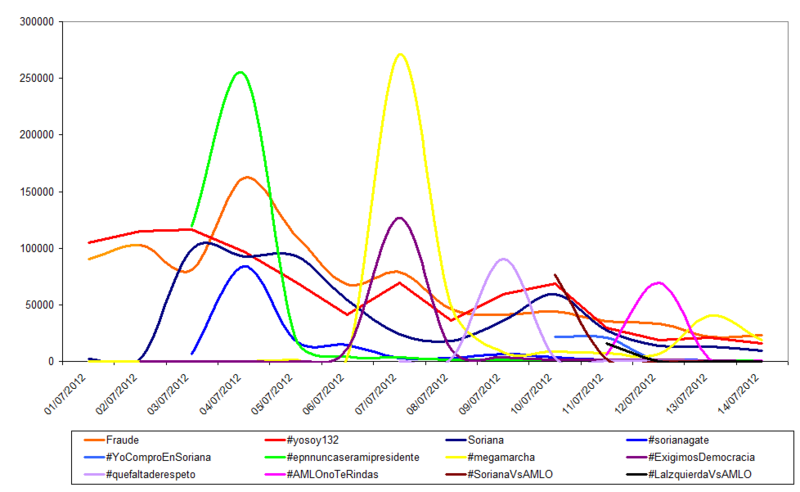 AMLO’s supporters have been generating Twitter’s trending topics since the election. Many of these soared to a couple of hundred thousand mentions in a day, although they have quickly died out. Two words, mosty used by AMLO’s fans, have kept consistently high volume of mentions: “fraude” (fraud) and #yosoy132 (I am 132, a student movement opposing the election of Mr Pena Nieto). “Soriana”, the supermarket chain whose vouchers were allegedly used to buy votes for Mr Pena Nieto, has been also frequently mentioned. It has developed variations such as #sorianagate or #yocomproensoriana (I shop in Soriana). 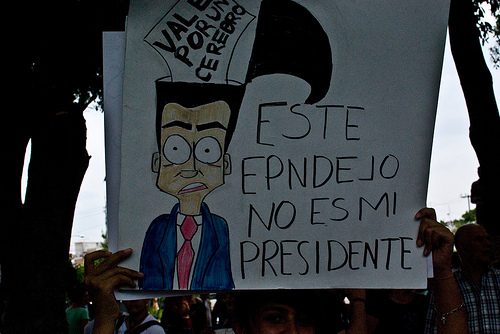 There have been short-lived strong hash tags such as #epnnuncaseramipresidente (EPN will never be my president), with over 370,000 mentions on 3 and 4 July or #megamarcha (mega march), with almost 370,000 mentions on 7 July, the day when the first “mega march” against the election results took place. #ExigimosDemocracia (we demand democracy), soared to 126,794 mentions on 7 July, followed by #quefaltaderespeto (what a lack of respect), with 90’545 on 9 July and then by #amlonoterindes (AMLO don’t give in), with 69,157 mentions on 12 July. Many influential twitterers criticized the PRD leaders for not backing Mr Lopez Obrador. Some said the elected PRD candidates owe their victories to AMLO. Although this claim is questionable. In the traditional PRD’s power base in Mexico City half a million more people voted for Mr Mancera in local elections than for Mr Lopez Obrador in the presidential poll on the same day. @garca_ale triggered 16 retweets on 11 July: “#AMLO radicalizes the left movement, believing that if they don’t think like him, they are against Mexico. Many in the PRD now seem to be coming to a conclusion that AMLO has no chance of winning them the country’s presidency. They have started considering their 2018 candidate for the top office. And although AMLO is still in the game, the names of Miguel Angel Mancera and the current Mexico City mayor Marcelo Ebrard have already been put forward.